XURON CHAIN and WIRE CUTTER. Measures 5" with blue easy to grip handle. This quality cutter will cut your chain and wire with the greatest of ease. 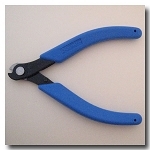 We are pleased to recommend this cutter as it is the one we use in our cutting rooms and at shows. Long lasting and made in the U.S.A. Please note: This tool is not a toy and is not intended to be used by children under age 15.